“Window Tinting Improves Security & Increases Property Value.” - A Detailed Insight! Security alarms and password-enabled locks are ways through which you can strengthen their home security. However, with these, there’s another strategy which works well in keeping your home safe- professional house tinting from experts in Melbourne at reasonable rates! “Fresh Window Tinting”, is your one-stop tinting company that caters to all your vivid requirements. We have a pool of highly trained tinting professionals who always provide top-quality and reasonable solutions to maintain your home privacy and safeguard your home from UV rays and possible break-ins! Perhaps the most direct consequence of our quality window tinting is that it limits outside visibility. With the impression of dark windows, it gives outsiders the impression that someone may be watching from the inside, and hence, lurking around the property could be potentially risky. Striving to be your reliable window tinting company in Melbourne; our experts always aim to provide peace-of-mind. Our window tints will make it nearly impossible for vandals thieves to see what’s inside. Without a clear line of sight, they may become hesitant possibly with the thought that the homeowner has set a trap to catch them, red-handed. So by creating a necessary darkness in your home and also forming doubts in the thieves mind, our tinting operations prevent your house from being an easy target for miscreants or evildoers. 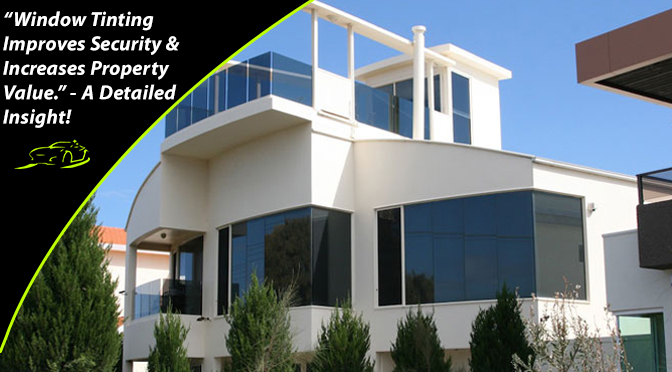 Furthermore; our onsite window tinting services present one more deterrent against shattering window glasses. Our tints are quality-proven and, on installation makes your window glasses shatter-resistant. As breaking-windows to get-in prove to be a common entryway for burglars; our tinting reinforcement helps stop such attempted break-ins. And those brave enough to try, they may collide against the whole window frame, and in the process get hurt badly. This increases your chances of catching them in the act. By reducing entry of sunrays; our window tinting operations make your home more private and comfortable to reside. Potential home buyers like homes with tinted windows that block the outside view but still allows insiders to see outside. Plus, they also appreciate the visual appeal it lends to the interior decor. So, this increases your chance of a successful home sale- if you wish to do so in the future! Too much exposure to sun’s rays can cause many health-related issues like accelerated aging, acne by drying out the skin’s moisture and even vision issues in the long-run. By adding our window tints to your gorgeous windows; you can make your abode a healthier one. And by that, you can expect to raise its overall value too! Lastly; our quality tinting operations will also safeguard your interior furniture, textile, family antique, vintage portrait, carpets/rugs and any priceless piece of artwork present. It is known to everyone that excessive UV exposure can break down pigments, create a bleaching effect and eventually ruin upholstery, rugs and curtains. Furthermore, UV rays can even heat up the surface and destroy leather, oil paintings, lacquers and even wooden varnishes. 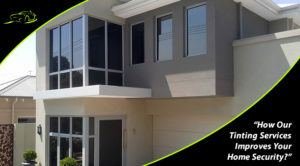 By contacting “Fresh Window Tinting”, for our sound and quality window tinting services in Melbourne you can aptly protect each of your household belongings. So, now that you know everything feel free to have a word with one of our tinting specialists. They will get you started! Next PostCar Windows Tinting – What a Glorious Way to Increase Resale Value! !